"The most important of discovery by any people that I know of was made by the Scythians (not that I approve of them otherwise). Their greatest discovery is this: to stop any invader escaping them, and make it impossible for anyone to catch them. They have no cities nor walls, but they are all horse-archers who carry their homes. They don't subsist from agriculture, but from their animals. With their houses on wheels, how could they not be invincible, or impossible to fight a battle with?" The Greeks used the name "Scythian", and Persians used "Saca" as comprehensive terms for the Iranian-speaking horse-riding archer nomads of the Steppe lands to the north of their own spheres of influence. 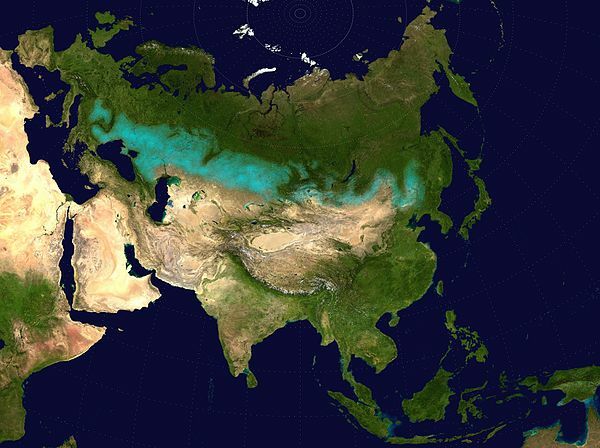 It seems likely that a Scythian culture, identified by its art, religion and burial customs (mounds called kurgans) once dominated the Steppes of Central Asia from the Danube to Mongolia. The only written historical records refer to the people whom the Greeks and Persians encountered, who lived on the Steppe between the Black Sea and the Aral Sea. Its not clear how far there was ever any political unity between these peoples themselves - and still less with the remaining "Scythians" scattered across Siberia. The nomads later called Scythians or Saca developed a pastoral culture which had travelled throughout the Eurasian steppe by around 1000 BC. Personal and tribal names surviving in foreign languages show they were Iranian speakers. 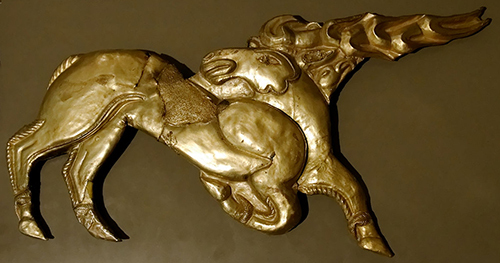 They also had a distinctive style of art - the "Scythian animal style", which dominated from the 7th to 4th centuries BC. This style, which originated around 900 BC in Central Asia used three very obvious motifs: a feline predator, a bird of prey, a hoofed or antlered herbivore. Their political organisation is unclear. There were many tribes; they were mobile and migrated freely. In the central area were peoples the Greeks called Sarmatians, Arimaspi, Issedones and Massagetae - and believed to be related to the Scythians. In Persian records there are "haoma-consuming Saca" (which suggests they may have been Zoroastrian) and the "pointed-hat Saca". During the 7th century BC, Scythians invaded Assyria, Urartu, Media, Babylonia, Egypt and Lydia: we assume this because objects from these civilisations have been found in Scythian tombs. But after this, they seem to have coexisted peacefully with Greek settlers (from late 7th century BC). For the Greeks "Scythia" stretched around and to the north of the Black Sea from the Ister (Danube) to the Tanaïs (Don) - through the modern states of Moldova, Ukraine and Russia. Greek colonies were established along the northern Black Sea coast - especially in Crimea. Herodotus and others present Scythia as a cold wilderness inhabited by savages who scalped each other, made clothes out of human skin, were covered in tatoos and got high on cannabis, or drunk on undiluted wine. Some of this may have actually been true, as suggested by recent archaeology. On the other hand, the Scythian Anacharsis came to Athens, became a friend of Solon, and was admired for his wisdom and common-sense. He was made a citizen (the first foreigner ever), but was murdered by his family when he went back to Scythia for being too Greek. "Scythian archers" first appear in Athens during the tyranny of Peisistratus (from 546 BC) - he used them as a police force in the city to maintain his power and keep order in the city. They continued to be used in democratic Athens - one appears as the first "comic policeman" in literary history in Aristophanes' Thesmophoriazusai. Cyrus attempted to subdue the Massagetae in 530 BC - his expedition ended in failure, humiliation at the hands of their queen Tomyris and his own death. Darius I records on the Bisitun inscription how he captured Skunkha, chief of the pointed-hat Saca. "I defeated the Saka utterly ... and their chief, called Skunkha - him they took prisoner, led to me in fetters ... after that, the country became mine." In around 513 BC Darius crossed the Danube to punish the Scythians, according to Herodotus. He had support from Greek cities, but the expedition was a failure, and he was forced to retreat [see quotation at top of the page]. But Saca fought for the Persians at Marathon and Plataea. Herodotus has stories illustrating his assertion that "the Scythians are a people who avoid foreign customs at all costs". As well as Anacharsis' sad fate [above], he tells of Skyles, a king whose Greek mother instilled in him a love of all things Greek. When he attacked Borysthenes, a Greek town on the Black Sea, he parked his army outside, and snuck in and paraded around in Greek dress where the Scythians couldn't see him. But when he was seen getting himself initiated into the cult of Bacchus it was too much - the Scythians deposed him in favour of his brother. He fled to Thrace, but the king Sitalkes handed him over - and he was beheaded. 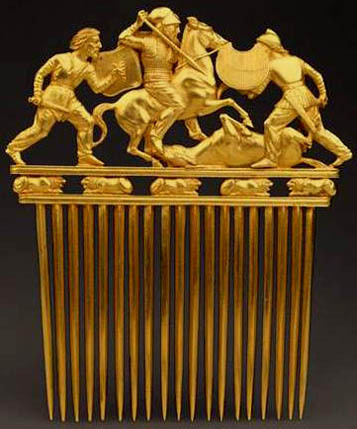 A burial mound at Solokhka may contain his remains - and objects from Greece, including this comb which may even illustrate the feud between Skyles and his brother. A gold signet ring with the inscription SKYLEO (Skyles') was found near the Greek colony of Istria - where his mother came from. After Alexander, there are no more literary references. Great tombs continued to be built, though, whose contents demonstrate the kings' wealth, and continuing contacts with the Greek and Achaemenid worlds. The burial mound at Pazaryk in the Altai produced the Pazaryk carpet - almost certainly from Achaemenid Persia, and many other unique finds - such as the "Ice Maiden", well-preserved mummies in larch coffins, cannabis seeds - and equipment for "smoking" such as described by Herodotus. The Jewish historian Josephus (ist century AD) first identified the Scythians with the Biblical Magog (Ezekiel 38-9), a people from the steppes destined to swoop down and destroy God's people. Christians continued to identify Magog (and its king Gog) with steppe peoples - Goths (from their name) - but also later Huns, Sarmatians, Arabs, Turks, Slavs, Khazars and Mongols and others: with Gog eventually equated with the Antichrist, and the battle with Gog Magog with the Apocalypse. Scythian dominance ends abruptly around 300 BC - for reasons unknown. They were replaced by Sarmatians and later by Huns - who also took over much of their culture. Small pockets of Scythians were still to be found on the fringes of their former range - they were finally extinguished by Goth invasions in the 3rd century AD. For more on the Asian Saca, see Yuezhi and also SEISTAN - the area in Baluchistan where Saca were eventually allowed to settle. 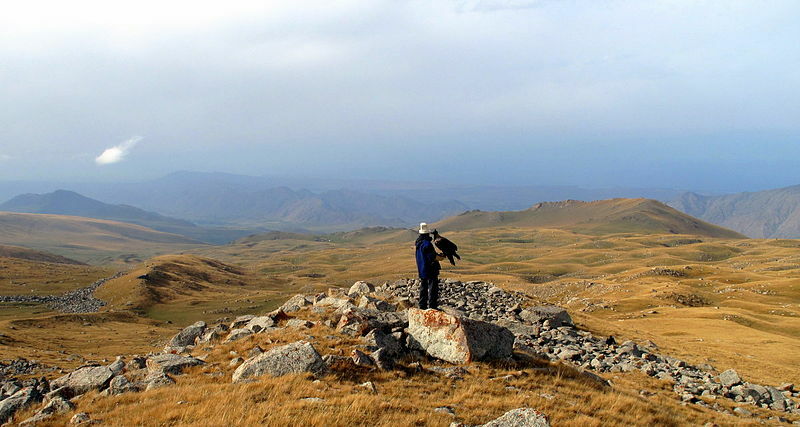 Eagle hunting on South Issy-Kol in the steppes of Kyrgyzstan. Herodotus tells how the Scythians not only made linen-like clothes out of "a plant called cannabis", but also enjoyed getting high from the smoke produced by the seeds. They didn't smoke it, of course - but threw the seeds on to hot stones inside a sort of tent, and sat round inhaling "a vapour such as no steam bath in Greece could surpass. The Scythians howl, awed and elated by the vapour." The Sarmatians were a people of the Eurasian steppe - related to, but distinct from, the Scythians and the Saca. They were also Iranian speakers. They came from the Ural region, and challenged the Scythians, whom they eventually overcame and replaced as the dominant culture - from around 200 BC until AD 300. Pliny locates them between the Vistula (Poland) and the Danube. They were ousted by the Huns in the 4th and 5th centuries AD. The Alans who later threatened both Rome and Parthia were a relic of the Sarmatians. The Polish nobility in the 17th century liked to claim descent from the Sarmatians.